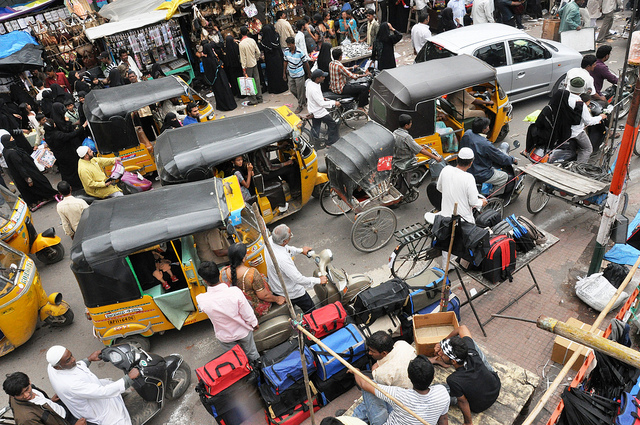 Auto-rickshaws are an integral part of urban transport in Indian cities. Photo by Kara Newhouse. This post was originally published on EMBARQ.org on February 10, 2012 by Divya Kottadiel. EMBARQ India organized and hosted Rickshaw Rising: An Auto-Rickshaw Entrepreneurship Summit on February 10 to present the challenges and opportunities of entrepreneur-driven organized fleet auto-rickshaw services, as an integral part of urban transport in Indian cities. The new report, “Sustainable Urban Transport in India: Role of the Auto-Rickshaw Sector,” co-authored by Akshay Mani, Madhav Pai and Rishi Aggarwal was officially launched at the summit. The report addresses how the auto-rickshaw sector can play a key role in improving sustainability for urban transport, and it addresses negative perceptions of the rickshaw sector. It also introduces new models of regulation and reforms that can be adopted for a more efficient and safer system, in order to ensure auto-rickshaws play an optimal role in the transport mix. Participants at the summit included entrepreneurs, members of civil society, investors, government officials, driver union representatives, and other key stakeholders, including manufacturers and engine and fuel technology providers. The event was part of the “Catalyzing New Mobility” project supported by the Rockefeller Foundation. Radio Tuk Tuk, a service that provides door-to-door commuting solutions in Gurgaon. Low incomes, compounded by debt and other expenses, result in auto-rickshaw drivers resorting to meter-tampering, refusals, over-charging and other behavior that enrages passengers, creating a negative image of the sector among the general public. The entrepreneurs talked about how organizing drivers under a credible brand addresses these challenges, brings additional benefits to drivers, and improves quality of service for passengers. They also highlighted the environmental benefits achieved through improvements in vehicles and operational efficiencies. Financial: A key challenge faced by the auto-rickshaw sector is stringent banking policies that prevent loans. Through innovative mechanisms entrepreneurs will work towards resolving this issue. Regulatory: Given the current scenario for obtaining permits, which could pose a barrier for new fleet companies, there is a need to set in place an appropriate regulatory framework for the entry of fleet auto-rickshaw companies. Institutional: The role of the driver unions vis-à-vis the entrepreneurship initiatives was discussed, and the way forward for unions and entrepreneurs to work together to promote fleet auto-rickshaw services. In the post-lunch session, entrepreneurs shared their experiences in running fleet services with other modes like taxis and cycle-rickshaws. Navdeep Asija, founder of Fazilka Ecocabs, the world’s first dial-a-rickshaw scheme that operates a network of cycle-rickshaws in Fazilka, Punjab; and Revathi Roy, founder of VIIRA, which operates a fleet of women taxi drivers in Mumbai, with plans to extend operations to include auto-rickshaw services, presented their business models and key learnings. Susan Zielinski from the University of Michigan’s Sustainable Mobility & Accessibility Research & Transformation (SMART) initiative brought the international perspective and shared ideas on global technology implementation, peer-learning and knowledge sharing opportunities that exist for entrepreneurs in India. The final session of the summit involved a panel discussion with Raj Cherubal of Chennai City Connect, Anuradha Bhavnani of Shell Foundation; Bharat Kalaskar, deputy regional transport officer for Mumbai; Frederick D’sa of Mumbai Rickshawmen’s Union, and Neeraj Gupta, managing director of MERU Cabs. The discussion focused on the relevance of social entrepreneurship initiatives in the auto-rickshaw sector; policy changes that address key issues faced by drivers and entrepreneurs, such as bank loans and directives on fuel usage; and several other design- and technology-related factors that concern this sector. developing a positive brand image of the auto-rickshaw sector among the general public, placing auto-rickshaws as an essential mode in the integrated transport framework of Indian cities. Moving forward, EMBARQ India plans to create a national knowledge exchange group and support other efforts around the country to implement entrepreneur-driven fleet auto-rickshaw services in cities.